Back in May 2013, we participated in a game jam called ToJam and we made a game in 3 days. This is how the original Toto Temple was born. 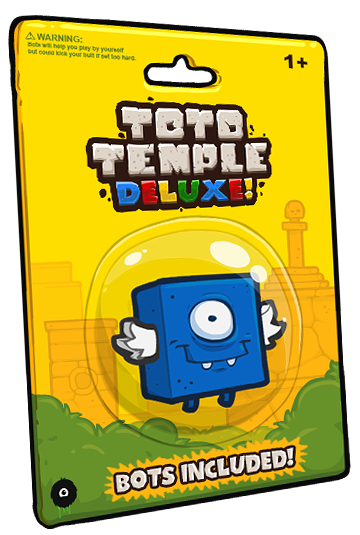 About a year later, after a lot of revisions, live events and even a partnership deal with Ouya, Toto Temple evolved into a bigger and better game called Toto Temple Deluxe! Notice how Yellow got to the goat before Green did? That’s it, you know how to play Toto Temple. We’ve added a lot more content since then, but the basics are still the same. “A” to join, “B” to… un-join? Super straightforward. You press A to join and when there’s at least 2 players, the “press start” option pops up and you can start the game. Note that there’s no “color selection” option (say what!?). You simply press “A” and figure out which color you got depending on which controller you picked up. The lack of color selection might seem weird at first, but it didn’t feel that important during the jam, especially since there’s no behavior/skills differences between each color (more on that below). Back in November 2013, the original Toto Temple was being featured at Gamercamp, a small and charming event taking place in Toronto. Between the jam version and the version we presented at Gamercamp, we’ve made a bunch of tweaks in the gameplay: smoother controls, balancing the points system, etc. One thing we didn’t do, though, was making changes to the UI system. Why would we change something that isn’t broken, right? 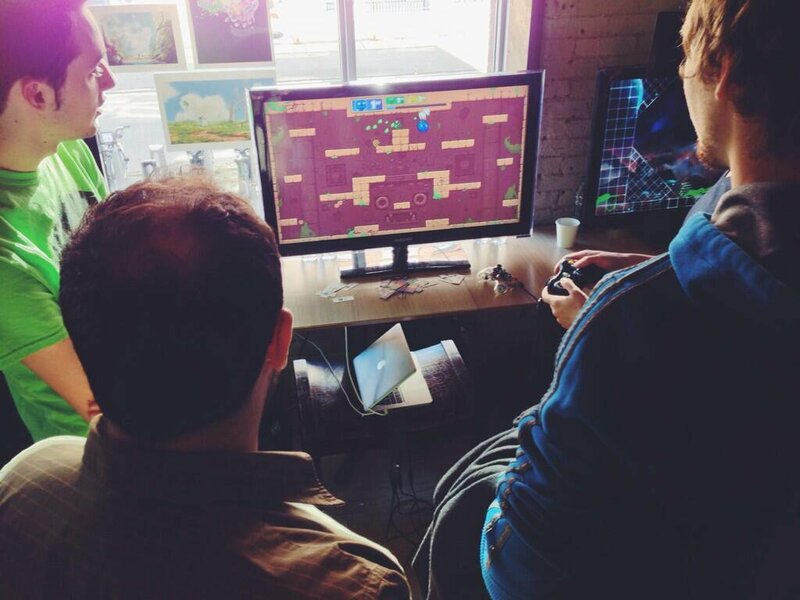 During a live event, the ideal scenario is usually to let players figure out the game / controls by themselves. It’s a lot less work for you and it’s a good sign that your game (or UI) is well designed. What we noticed back then is that once in the game, most players had no clue how to navigate using the “dash” mechanic. Even after “reading” the short tutorial for controls and listening to our oral explanations, players kept moving around by running and jumping. Over and over, you could hear us say: “To dash, you need to press the X button AND the direction in which you’d like to dash. So to dash up, you push the left joystick up and you press X at the same time. You can dash in all 4 directions, even left up right down consecutively if you want”. What we think was happening is that players associated the dash mechanic with “stealing the goat”, and only with that, since it’s the main objective. They would wait to come aligned with the goat carrier before dashing. Like we mentioned above, dashing can be used to move around faster, something most players didn’t think of. It’s technically not a bad thing, since you’re supposed to learn that kind of stuff by yourself as you play, but we still felt like we could have done a better job at introducing the concept to new players. At that point, we noticed that dashing in multiple directions was definitely something most players had trouble with. Dashing left and right was kind of okay, though. Since your Toto was automatically facing left or right, you ended up dashing in one direction or the other by simply pressing X (no direction). Dashing down is not often required at first (you start using it more as you start dashing to move around a lot). The real problem was dashing up. You had to dash up way more often than down, since gravity was pulling you down and you often wanted to go up in the level. Eventually, players would understand that dashing is always useful, but it was hard to enjoy the game and be competitive without knowing that important detail. We had to do something about it. A short time after gathering all that new information, we got invited to demo Toto Temple at a small gaming event in Montreal called The Prince of Arcade. It was a good occasion to try and improve the game’s teaching methods and see it in action. 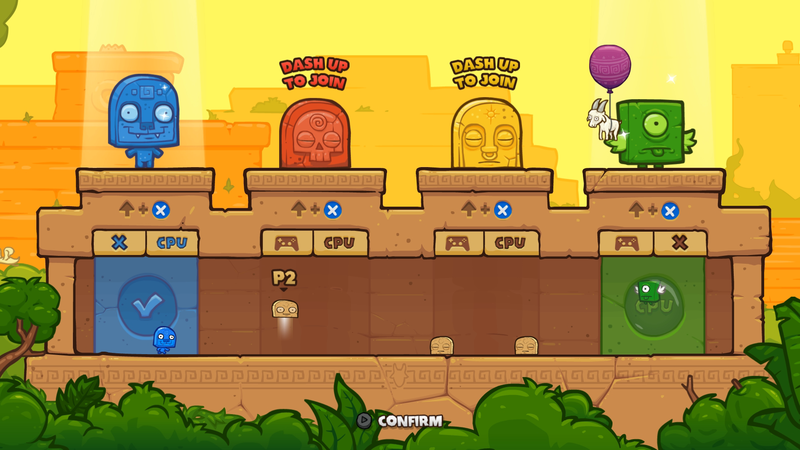 First idea we had to solve the dashing problem was to bring the platforming and the physics into the menu and literally ask players to dash up to join the game, instead of simply pressing “A”. It wouldn’t teach them how to play, but they would at least be aware of the key combination. After watching players play the game all evening, we noticed that most of them would take less time to start dashing in different directions. The new “playable” menu definitely had an impact. We didn’t know back then, but that would end up being our very first step towards a completely physical and playable UI. Shortly after testing out the playable menu, we got in touch with the great folks at Ouya and managed to get a partnership deal for a bigger and better version of the game. 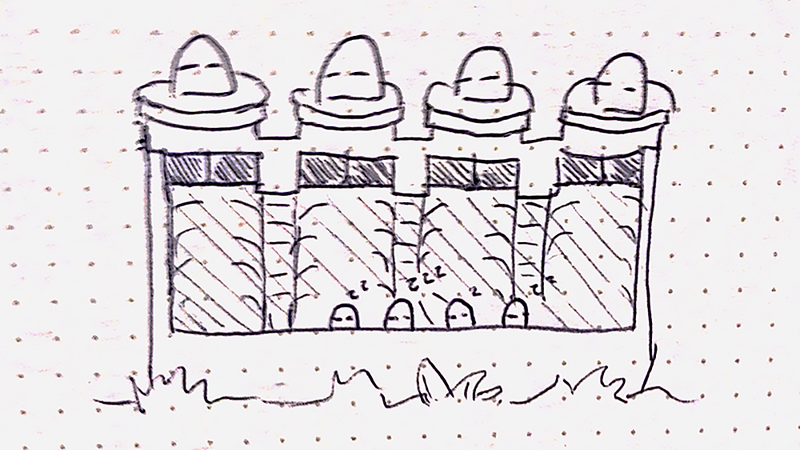 We had plans for more levels, new modes, power-ups, and of course, a completely new UI system. Since we were going for a physical and playable approach for the new UI, we decided to literally go “outdoors” with temple-like boxes, etc. No more abstract boxes! Smell that fresh air? The first version based on the new look & feel was pretty much the same thing, but inside some nice looking pillars in an outdoor scenery (see above), you know, instead of boring and flat boxes. Since we didn’t have that big and colorful picture of the player in the background anymore, we added colored statues on top to really add contrast regarding who is in and who is not. It creates a visual mass in the top part of the screen that is easier for the eye to scan, compared to just a button being on / off. While not the main purpose, it also creates a small visual celebration. As a newcomer, it makes you feel a bit like the game is happy that you joined! Now for some strange reasons we still don’t understand, we’ve seen a lot of player dash up to join the game, then immediately dash down to leave the game. Then dash up, then dash down. Again and again and again. They would do that until someone pressed start, and if they were lucky, they would happen to be “in” as the game progressed to the next step. Most of the time, they ended up being “out” and we had to go back, wait for them to join, then proceed again. The worst cases were the ones when another player would mindlessly dash down and leave as we were waiting for the remaining player to join. What the heck? What we think is that players aren’t used to have an impact on the UI by playing around with their character. They simply don’t realize their actions are changing the game’s settings. To fix the problem, we simply removed the “dash down to quit” button (see above). We also made the background light up to make it more obvious that you’re in. To leave the game, you had to dash in the “join” button again (a toggle system, basically). It helped reduce the amount of weird “switch flicking”, but once in a while we can still see some players join and leave over and over using only the top button. It didn’t completely fix the problem, but at least they seem to understand what to do after their first try. The new “character selection” was done and functional, but we still needed new menus for that new Deluxe content (levels, modes, etc). To be honest, we haven’t thought much about that when we made the first playable menu screen. While designing pretty much anything, you usually want to keep visual and functional unity through the whole process. Since we had “buttons” that needed to be dashed into in the first screen, it made sense that we kept the same system for the other screens. The first menu to follow was the level selection screen, and things started to get a bit more complicated from that point in time. On a more fundamental level, the moment we switched to a playable menu system, most controller inputs became forbidden for anything except controlling your character. Moving the left joystick would now move your character, so we couldn’t use any cursor or pointer. Pressing the A button would make your character jump, so we couldn’t use it to confirm any actions. Pressing X would do the same thing, since you’d use it to dash into the different buttons. We already had that problem with the first version, but we simply went with the “Start” button to start the game. It was a pretty easy fix. The next menu screen we ended up needing was a “level selection” screen. 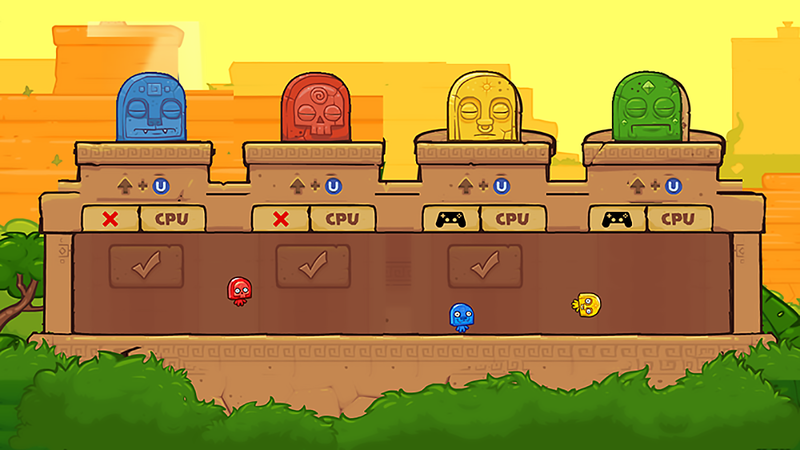 We were aiming at 5 or 6 new Deluxe levels (or temples), so we needed a way to chose one from the bunch. Still missing some assets, but you get the point. While sketching the new screen, we thought: “Hey, what a good opportunity to teach even more stuff to players!”. Those buttons are too high? Well guess what, you can jump and dash consecutively! To help understand the directives a bit more, we even added subtle decoration details to guide your eye from the starting position of your character, all the way up to the buttons on each sides. We’ve seen a lot of players simply select the default level by pressing start right away on their first playtest. We concluded that it was okay since you usually don’t know any of the levels on your first try (the first one is as good as any other). They saw that there were other levels available, so they understood that it was possible to manually choose. Most players recognized the buttons and the fact they need to bump into them, just like they did in the previous screen. 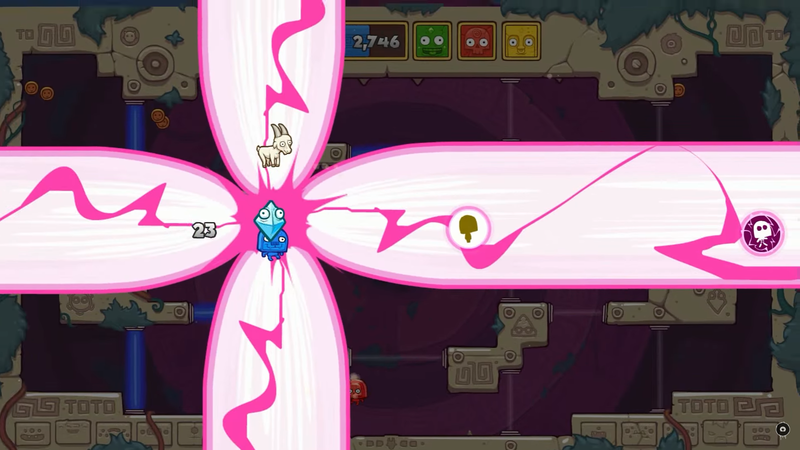 Players understood the “jump and dash” combination, but since they were new at the game, they were having a hard time hitting the button multiple times in a row. The problem was coming from the fact that your eye wanted to look at the level thumbnails so you can pick the one you liked, but you felt like you also needed to look at your character to make sure you were aiming correctly at the button. It was weird and unpleasant. Some of them also took a bit too much time to figure out that the X button could be use for something else than joining the game (they probably didn’t notice the dash animation while they were looking at their controller to spot the X button). To make it more comfortable to select a level, we added little steps so you could mindlessly dash left or right and focus on the level thumbnail. It wasn’t teaching you to jump and dash consecutively anymore, but it was at least teaching you to jump (necessary to reach the button), a thing that the previous screen didn’t require. We added level icons with a single thumbnail so it could be easier to see the whole picture (how many levels total). We moved the “dash left / right” instruction from the middle top to both sides. They’re also closer to each button so they were easier to notice and we made them blue like the actual X button (in this case it’s U for the Ouya equivalent). It wasn’t much of a problem, but we made the whole box smaller in width so it’d take less time to dash from one button to the other. The last menu to come in was the “mode selection” screen. Even if it was very simple at its core, it also happened to be the trickiest to implement. Character selection comes first since we’ll need to know how many players will join for the next step. Mode selection is second, so you can quickly define the teams if that was your intention from the start. We want to let you set what you have in mind as soon as possible, so you don’t have to wait and “remember it”. Level selection comes last. If we ever decide to create “mode-specific” levels, the filter will already be defined. For the “mode selection”, we basically needed a simple way of selecting a mode from a list, just like with the “level selection”. An obvious choice was to duplicate the screen we made for the “level selection”, but it didn’t feel right (hard to quickly differentiate one screen from the other, etc). We also wanted to cover as much of the different controls as possible, so the other obvious choice was to ask players to dash up and down (instead of left and right) to go through the list. With a button at the top and one at the bottom, the screen was pretty much done. Then the hard part came in and we had to design the team selection box (below). As you probably remember, one of the trickiest detail we had to deal with was that most of the controller buttons are already used to move your character around. Setting up teams without the use of a joystick-controlled cursor or the “A” button to confirm anything forced us to go in a different way. With only a small physical box at disposition, we had to design a system that was easy to understand, fast to setup and that didn’t use any controller buttons. We’ve never really encountered major problems with this screen so far, so we’ve kept like that since. They might not clearly remember everything they did in the menus, but their subconscious picture of the controls should look like this (below). Its a good thing, since it’s exactly all the buttons they’ll need to play the game! A first version of Toto Temple Deluxe has been released on Ouya, and you’ve already seen the most of the UI that went into the game. Following the release, we did like we always do: we kept interacting with fans in forums, comments, blogs, etc. I don’t have friends to play with, can you add bots? I want to be able to choose my color at the start of the game! I know it doesn’t change anything gameplay-wise, but [insert color] is my favorite color and I’d like to play with it. Both of these are super legit requests, and after some long discussions to evaluate the costs of implementing those things, we decided to go for it even if it was expensive, long and complicated. Not very bright, I know. But we love you. Both “bots selection” and “color selection” are closely related to “character selection”, which we quickly identified as a problem, UI-wise at least. Our current menu for “character selection” (if we can even call it a “selection”) wasn’t really designed to give players a choice of color or character. The pillar boxes are pretty small, and handling a bots selection system later on would also add up to the clogginess. We tried to think of different solutions to keep our current UI for that screen, but none of them was efficient, clean or simply felt right. We then decided to start over from scratch! Characters automatically jump when you push the joystick to wake them up. That way, you can spot which one you are right when you’re expecting visual feedback! We kept the big statues. It’s not a change, but we loved them too much to get rid of them. We now have a big public box, instead of beautiful, individual pillars (still sad about those pillars). We added uncolored Totos with player numbers over their heads so you can keep track of who you are. You can now choose the color you want by dashing in the corresponding button. You can switch from your current color to an unselected one directly. You can’t steal someone’s color, and vice versa. The other most popular request was to add bots so that players could play when no one else is around. *Each sold separately, batteries not included. We spent a couple weeks making the actual bots, then it was time to make them selectable in the menu. Adding this feature to the previous character selection screen would have been a bit a lot complicated, but it ended up being pretty easy with the new design. The only thing we needed was a way for players to decide “I will play as this color, and I want this and that color to play as bots”. We basically stuck with the first idea that came to our mind, which was to split the “join” button in half. One side will join you as a player, and the other will spawn a bot of the current color. After a bit of testing, we saw some players pick a color, and then proceed without adding any bots. It’s a pretty normal behavior, considering that it might not be super obvious that you’ll need bots upfront to play against. To patch the problem, we made it so that if you’re proceeding to the next screen by yourself (no bots), the game will automatically add a temporary, semi-transparent bot by your side (see below). If you select a “2 players minimum” mode, like Tournament, the bot will then appear normally to let you know it’s confirmed. With this patch, you’re able to go through the whole menu flow without knowing everything, and play competitively. Our previous version would only let you play in Target Challenge, since it’s the only solo mode. If you don’t know that as a first time player, you end up playing a secondary mode and not knowing it, which obviously isn’t the goal. Making a fully playable UI was definitely a good experiment for us. Even if it wasn’t completely necessary, it helped convey the complexity of the controls to new players. We could have relied on traditional, text-based tutorials, but most player would have just ignored them to then have a hard time playing the game like it’s supposed to be played. Games with really simple mechanics or barely no menus may not really benefit from this kind of system. On the other hand, a playable UI could help preserve immersion and overall unity even if you don’t need it as a teaching tool. Look at games like Antichamber by Alexander Bruce and Braid by Jonathan Blow. They both have playable menus, even if they don’t necessarily teach the player how to play the game in a literal way. Instead, they help preserve immersion, so that you’re not cut out of the game’s universe each time you need to use a menu. Obviously, we’re not implying that our method is the best / only way to do a playable menu. It’s just a long walkthrough (maybe too long, sorry) of our development process. If you think it could have been done better based on our game’s needs, or if you have any comments, feedback or questions, we would love to hear them! Please let us know what you think in the comments below. 9/10 is a great score, we’ll take it! Thanks for sharing this, it has given me a great deal of insight. It’s great to see articles like this where you go in details about your UI menu. Good job, and keep it up, it’s a fun reading ;). Thanks Benoît! We’re aware that not everybody will be interested in such details, but if it can help another dev, or simply demonstrate how much care went into the game’s details, we’re pleased! Can we add Rayman to this list? If you’re thinking of the sign posts in Rayman Legends , for instance, we totally could! In this case though, it’s the same concept that Braid used in the example above. Really nice article! Some of the design decisions really made me think about menus in different light. Thanks for this very insightful write-up. It looks like you did everything right when designing your playable menus. Nice job! i like this 🙂 good job! I want to become a UI artist and this article was just SO instructive. Thanks a lot! A fascinating discussion, and VERY different from how I would have done things. I don’t like button motion combos at all if they can be avoided. To me, this game seems to scream out for simple twin stick controls. You use either the left stick or D-pad for “slow” movement, and you use either the right stick or cross buttons for “dash” movement. That way, you don’t have to do button/motion combos in order to do anything. 1. As we’ve mentioned in the article, we’re paying close attention to the players’ subconscious picture of the controls. It’s way easier, especially because of the norms, to associate movement in general to the left joystick. Mapping the dash action on the right joystick would split the movement association in two. In order, your brain would first define an objective / destination on the screen (where you want to go), to then find the associated control to do so. If moving always translates to the left joystick, your reaction time should be relatively fast. If you have 2 possible ways to move around, your brain would need a couple extra milliseconds to process which joystick you should use. Those extra milliseconds are enough to add friction and make the whole thing uncomfortable. 2. 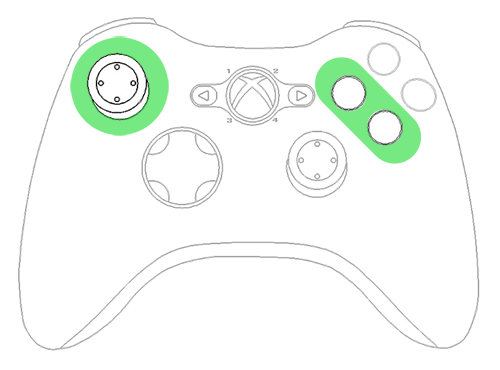 The other reason why we wouldn’t use 2 different joysticks is that we would lose quick and easy access to the jump button (“A” on Xbox 360 controllers). Moving your thumb from the right joystick to A wouldn’t be as quick and easy as moving it from X to A (current system). We jump a lot to perform more subtle actions, like grabbing coins as you’re running, breaking your dash sequence to precisely start another one, etc. Great take on UI design as a subtle unobtrusive teaching aid for game mechanics. I’ve been following your company for a while know and you’ve all really gotten better at your craft. Any chance that you might revisit some of your older works *cough*Bloom Defender*cough* and apply all this sage wisdom you’ve gained over the years. Thanks a lot, we’re pleased to know that you’ve been following us for a while (if you know us all the way back from Gobtron, we’re seriously amazed)! The idea of revisiting our old games and see how they would change is definitely interesting. The only “problem” would be that we have a ton of new ideas and not enough time to make them all. Deciding which concept to explore for our next game is always a struggle, so revising old work kind of feel counter intuitive for us.